The lavender candle is used to soothe anxiety and aid restful sleep. Its history as a wellness treatment goes back through the ages. 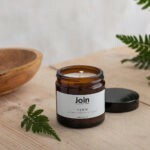 These luxury scented candles are handmade in London by Join, using 100% vegan soy wax and essential oils. The amber glass jar gives them a warming glow. The lavender essential oil in these aromatherapy candles soothes and restores balance. So they’re perfect during a relaxing bath or for a night in. To lengthen the comforting moments, light your luxury candles during breakfast and at your workplace, to create harmony and focus. Each soy wax candle is individually gift wrapped in a recycled cardboard box. You can leave a personal message to be included at checkout if you wish. Available in three sizes with varying burn time (see dropdown selection list for details). See all of Join’s essential oil candles, reed diffusers and room mists here.